A check dam is a small, sometimes temporary, dam constructed across a swale, drainage ditch, or waterway to counteract erosion by reducing water flow velocity. Check dams themselves are not a type of new technology; rather, they are an ancient technique dating all the way back to the second century A.D. Check dams are typically, though not always, implemented as a system of several check dams situated at regular intervals across the area of interest. A check dam placed in the ditch, swale, or channel interrupts the flow of water and flattens the gradient of the channel, thereby reducing the velocity. In turn, this obstruction induces infiltration rather than eroding the channel. They can be used not only to slow flow velocity but also to distribute flows across a swale to avoid preferential paths and guide flows toward vegetation. Although some sedimentation may result behind the dam, check dams do not primarily function as sediment trapping devices. Check dams could be designed to create small reservoirs, without possibility of silting. A self desilting design was published in 'Invention Intelligence, August, 1987, which while being permanent, would also remove silt as it is formed, keeping the reservoir capacity maximum. The design envisages an awning, going very near the bottom level, extending to the width of the dam, and embedding into the sides. When freshets occur, the silt is automatically carried over to down stream, keeping the reservoir clear. Check dams have traditionally been implemented in two main environments: across channel bottoms and on hilly slopes. Check dams are used primarily to control water velocity, conserve soil, and improve land. They are used when other flow-control practices, such as lining the channel or creating bioswales is impractical. Accordingly, they are commonly used in degrading temporary channels, in which permanent stabilization is impractical and infeasible in terms of resource allocation and funding due to the short life period. Or, they are used when construction delays and weather conditions prevent timely installation of other erosion control practices. This is typically seen during the construction process of large-scale permanent dams or erosion control. As such, check dams serve as temporary grade-control mechanisms along waterways until resolute stabilization is established or along permanent swales that need protection prior to installation of a non-erodible lining. Many check dams tend to form stream pools. Under low-flow circumstances, water either infiltrates into the ground, evaporates, or seeps through or under the dam. Under high flow - flood - conditions, water flows over or through the structure. Coarse and medium-grained sediment from runoff tends to be deposited behind check dams, while finer grains flow through. Extra nutrients, phosphorus, nitrogen, heavy metals, and floating garbage are also trapped by check dams, increasing their effectiveness as water quality control measures. Before installing a check dam, careful inspection of the site must be undertaken. The drainage area should be ten acres or less. The waterway should be on a slope of no more than 50% and should have a minimum depth to bedrock of 2 ft. Check dams are often used in natural or constructed channels or swales. They should never be placed in live streams unless approved by appropriate local, state and/or federal authorities. A check dam should not be more than 2 ft (0.61 m) to 3 ft (0.91 m) high. and the center of the dam should be at least 6 in (0.15 m) lower than its edges. They may kill grass linings in channels if water stays high or sediment load is great. This criteria induces a weir effect, resulting in increased water surface level upstream for some, if not all flow conditions. In order to effectively slow down water velocity to counter the effects of erosion and protect the channel between dams in a larger system, the spacing must be designed properly. The check dams should be spaced such that the toe of the upstream check dam is equal to the elevation of the downstream check dam's crest. By doing so, the water can pond between check dams and thus slow the flow's velocity down substantially as the water progresses downslope. Check dams are a highly effective practice to reduce flow velocities in channels and waterways. Contrasting big dams, check dams have a faster implementation timeline, are cost effective, and are smaller in scope. Because of this, their implementation will not typically displace people or communities nor will they destroy natural resources if careful design considerations are undertaken. Moreover, the dams themselves are simple to construct and do not rely on advanced technologies – thereby they can be applied in more rural and less advanced communities, as they have been in India’s drylands for some time now. Check dams still require maintenance and sediment removal practices. 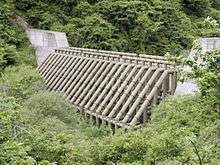 They become more difficult to implement on steep slopes, as velocity is higher and thereby the distance between dams must be shortened. Check dams, depending on the material used, can have a limited life span but if implemented correctly can be considered permanent though not encouraged. 1 2 Marsh, William M. (2010). Landscape Planning: Environmental Applications (5th ed.). Danvers, MA: John Wiley & Sons, Inc. pp. 267–268. ISBN 978-0-470-57081-4. 1 2 Mississippi Department of Environmental Quality. Erosion Stormwater Manual (PDF) (4th ed.). Mississippi DEQ. pp. 4–118. Retrieved October 21, 2014. ↑ Melbourne Water (2005). Water Sensitive Urban Design Engineering Procedures: Stormwater. Australia: CSIRO Publishing. p. 140. ISBN 0-643-09092-4. Retrieved 28 October 2014. 1 2 3 4 5 6 Iowa Statewide Urban Design and Specifications (SUDAS) (2013). Design Manual - Erosion and Sediment Control (PDF). Ames, IA: Institute for Transportation at Iowa State University. Retrieved 28 October 2014. ↑ Garcia, Carmelo & Mario Lenzi (2010). Check Dams, Morphological Adjustments and Erosion Control in Torrential Streams. New York: Nova Science Publishers. ISBN 978-1-61761-749-2. 1 2 3 4 5 6 United States Environmental Protection Agency. "Water Best Management Practices: Check Dams". water.epa.gov. USEPA. Retrieved 28 October 2014. ↑ North Carolina Department of Environment and Natural Resources (2006). Practice Standards and Specifications. Raleigh, N.C.: NCDENR. pp. 6.83.1–6.83.3. Retrieved 28 October 2014. ↑ Urban Drainage and Flood Control District (2010). Urban Storm Drainage Criteria Manual Volume 3 (PDF). Colorado: Urban Drainage and Flood Control District. Retrieved 28 October 2014. ↑ Mazzorana, Bruno (6 June 2014). "The susceptibility of consolidation check dams as a key factor for maintenance planning". Österreichische Wasser- und Abfallwirtschaft. 66 (5): 214–216. doi:10.1007/s00506-014-0160-4. Retrieved 5 October 2014. 1 2 Department of Environmental Quality (2005). IDEQ Stormwater Best Management Practices Catalog: Check Dams BMP 32 (PDF). State of Idaho. pp. 106–108. Retrieved 28 October 2014. ↑ USDA Natural Resource Conservation Services (NRCS). "Urban BMPs: Water Erosion" (PDF). usda.gov. USDA. Retrieved 28 October 2014. ↑ "FAO Watershed Management Field Manual". fao.org. Food and Agricultural Organizations of the United Nations. Retrieved 28 October 2014. ↑ Urban BMPs: Water, erosion, check dams (PDF). United States Department of Agriculture. Retrieved 4 November 2014. ↑ Rickard, Charles & Rodney Day, Jeremy Purseglove (2003). River Weirs – Good Practice Guide (PDF). UK: Environment Agency. p. xi. Retrieved 4 November 2014. 1 2 Agoramoorthy, Govindasamy, and Minna J. Hsu (2008). "Small Size, Big Potential: Check Dams for Sustainable Development". Environment. 50 (4): 22–34. doi:10.3200/envt.50.4.22-35. Retrieved 28 October 2014.